Companies performing a web search using terms relevant to their business often find a competitor at the top of the list. It’s definitely frustrating, but it does not have to be that way. Search visibility is a key to gaining new website visitors and the increased market share they bring. Top search engine rankings are the product of carefully crafted page content, appropriate meta tags and competitive analysis of how your target audience thinks and searches, as well as other elements that all work together to create the “relevancy” search engines look for in their highest-ranked websites. St. Louis Web Designz works with clients at a variety of service levels to help obtain top search rankings for desired keywords and search phrases. Guided by the latest trends in the ever-changing world of search engines we continuously revise and adjust our practices for optimal results. We're not satisfied with simply helping our clients achieve top search engine rankings though. We measure your success based on the complete picture of increased rankings, traffic, leads, conversions, and sales. We start every campaign by setting up Google Analytics properly. You may already have it installed on your site, but we make sure it's tracking everything possible, including e-commerce orders, Google AdWords, conversion goals, mailing list mailouts, twitter traffic, facebook traffic, and Google Places traffic. We want to set this up first thing so that we can establish some baseline data that will allow us to precisely monitor and report how well our SEO efforts are converting directly into sales. We perform an in-depth technical analysis of your existing site and architecture. We check for hosting issues, duplicate content, canonicalization issues, improper use of robots.txt and/or meta robots, URL structure, site architecture, internal linking, outbound linking and more. We use a variety of keyword research tools to identify the most searched for key phrases in your industry, and ensure that the keywords we focus on are the best options for driving targeted traffic to your site. The keyword list we recommend targeting will continue to evolve over time. It is our intention to bring in traffic to your site through ongoing optimization of a continually growing and changing list of key phrases that reflect your changing business goals. We go through your site page by page and make a number of recommendations for adjustments to your site architecture, programming, title tag, meta description, heading tags, body text, footer structure, URL structure, internal linking, sitemaps, robots.txt file, redirects, and more. Our goal is to make sure you have relevant pages on your site with enough content to be perfectly targeted to the keywords we identified in the keyword research stage. Having a perfectly optimized site will only get you so far. To get top rankings, you need inbound links from relevant, quality, authority sites. We perform extensive link prospecting and competitive analysis to identify your best link opportunities, then we devise strategies for acquiring links from those websites. We're not interested in only getting you the same links your competitors have. We look for the unique link opportunities that your competitors can't get. 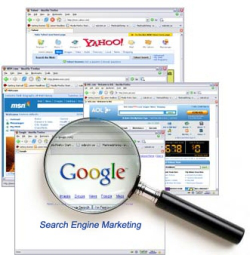 Effective search engine optimization requires ongoing maintenance. Search algorithms will change, your business will change, you will continually add new content, and your competitors will get more links. We form long-term partnerships with our SEO clients and help them to continually to improve their rankings, traffic, leads, and conversions, month after month. During the ongoing optimization phase we work with you on content development, continued link prospecting and acquisition, continued keyword research and on-site recommendations, social media consulting, and conversion rate optimization. Total traffic to the site compared against the previous month, broken down into direct traffic, traffic from search engines, and traffic from referring websites. Total number of goal conversions on your website compared to the previous month. Top landing pages of the site compared to the previous month. Top non-branded key phrases bringing in traffic to the site compared to the previous month. Google ranking positions for the top keyword phrases being targeted. Google ranking positions for terms that we are ranking well for, but were unaware of (long tail terms identified through Google Analytics). A breakdown of the activities we focused our work on for the month. St. Louis Web Designz is a local, full service web design and development house serving small to medium size organizations in the Metropolitan St. Louis Region. © Copyright 2018 by St. Louis Web Designz. All Rights Reserved.